One amazing aspect of traveling around Italy is having the opportunity to eat some of the best and freshest food in the world. Every Italian region, even city, has their own dishes that are unique to each area. 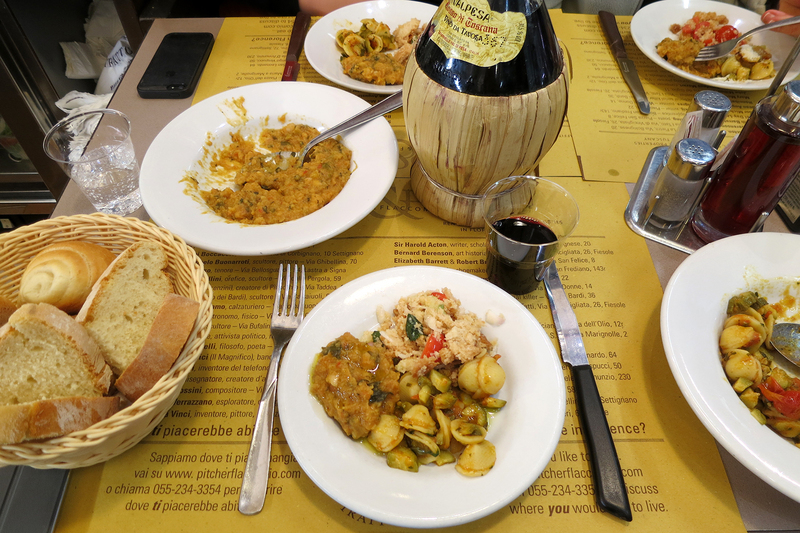 If you make your way to Florence, don’t forget to try the most traditional food and wine the city offers with a Florence food tour. With a local guide, get ready to taste the spots where the locals go — those hidden delicacies that are not always listed in guide books. The meeting point was at 9am at Piazza Santa Croce by the Dante Alighieri statue. Our local food guide, Coral, was there waiting for us and we soon were off throughout the streets. She shared interesting food tales about the city while we made our way from place to place, pointing out important gastronomic areas and signs throughout town. Why not start with some wine at Enoteca Alla Sosta dei Papi? Yes, we had our first wine at 10am, but it’s vacation so no judging! 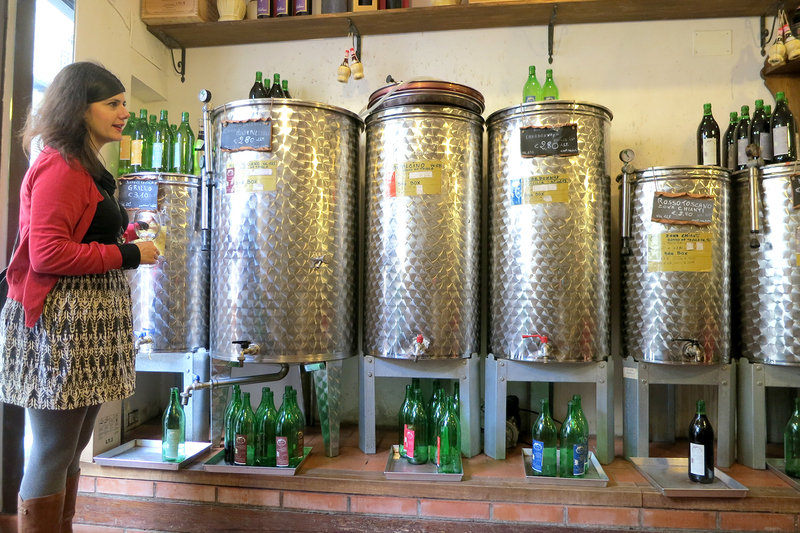 We were able to taste a few local reds and whites that we poured ourselves from the large vats, just as the locals do. Our table was filled with many types of crostini like the popular bruschetta, mushroom spread, olive spread and a few toasted bread slices with the best olive oil ever. Coral gave us a run-down on the types of wine and advised us what to pair with which crostini. The tasting finished with a very Tuscan dessert of Vin Santo and cantuccini. Vin Santo is a delicious sweet wine that you dunk the cantuccini (biscotti) in. It’s a wonderful pairing! 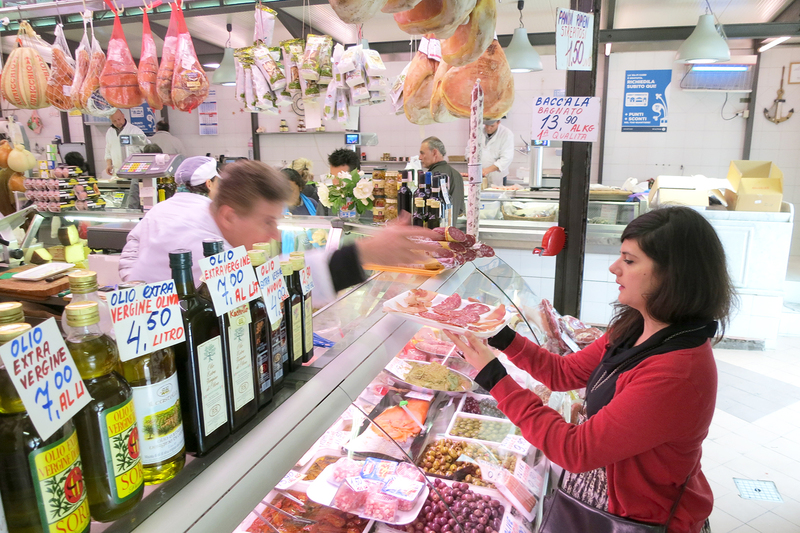 On this Florence food tour, we also had time to check out the local food market where Italians do their regular shopping. The Sant’Ambrogio Market, one of the best markets in Italy, is quite large and spills out onto the street with many more shops inside. It was time to do some serious prosciutto and cheese tasting. The owner of one of the stands set up a few plates for us to taste the difference between prosciutto, salami, porchetta, finocchiona, soppressata…and even taste the difference between regions. Oh and don’t forget all the different types of olives! The cheese was also incredible as we tried young and aged cheese and even pecorino romano and parmigiano romano. It was really fun trying the many ages of the cheese and you’d certainly leave with a better understanding of the difference in taste between the year and type of milk the farmers used. As if we were not full yet, it was lunch time! We headed to Trattoria da Rocco in the heart of the Sant’Ambrogio Market. We had a nice bottle of Chianti ready for a hearty meal. Our group of four shared a large plate of orecchiette pasta with zucchini, perfectly fresh! Next was panzanella which is a traditional Tuscan Summer dish with salad and bread, so served cool. Lastly, we enjoyed their ribollita— a Tuscan soup cooked down with local bread and vegetables. It’s known as a peasant dish from the Middle Ages that was made by reheating minestrone from the day before with bread. We polished it all off and finished up like any good Italian with an espresso. How can you not have gelato? 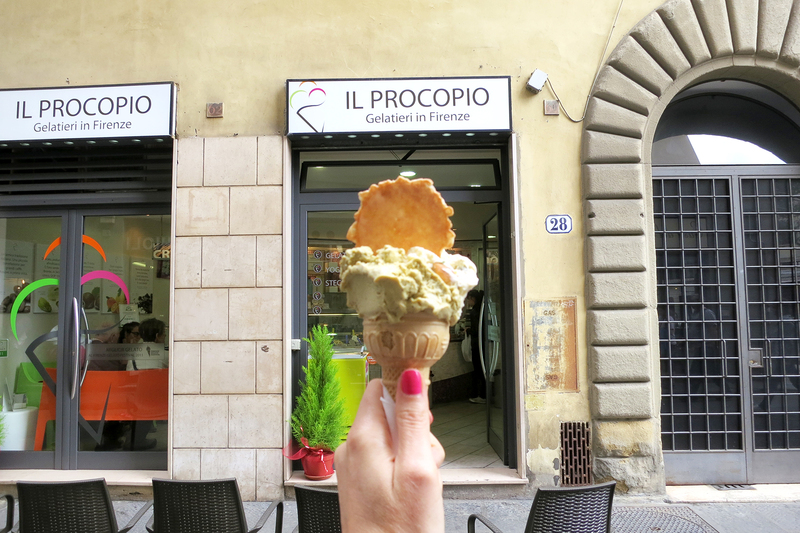 Our last stop on the Florence Food Tour was at Il Procopio Gelateria, owned by Gianpaolo and Barbara. Lucky for us we got a sneak peek at their kitchen and watched Gianpaolo make a fresh batch of gelato with fresh pistacchio and candied orange slices. They have one of the best gelaterias in town, serving a decadent sorbet of pistacchio di Bronte, Sicily—only the best ingredients! If you’re staying in Florence for a few days then don’t forget to check out the best restaurants and panini in town. Are you hungry yet? Good, we hope to see you on our Florence food tour! There’s a lot of good restaurant in Florence. Trattoria da Rocco is definitely one of them. A must for those who love Italian food is a biennial food and wine in Florence, an event held every two years and offers the best of Tuscan cuisine as well as other Italian dishes. The event also offers many opportunities to enjoy the best hosts Tuscan wines known and appreciated all over the world as the best wines.